Appetizers first – then the main dish. Because I know so many of the names entered, one of the ladies in the office wheeled the computer mouse back-and-forth and picked a random winner from the comments… Michelle of Island Life Quilts. You know they’re a little goofy, don’t you? I rest my case. Goofballs. Yes, all of these ladies design fabric for Moda and create all sorts of beautiful quilts, bags and other lovely things. In the front, that’s Corey Yoder of Coriander Quilts. 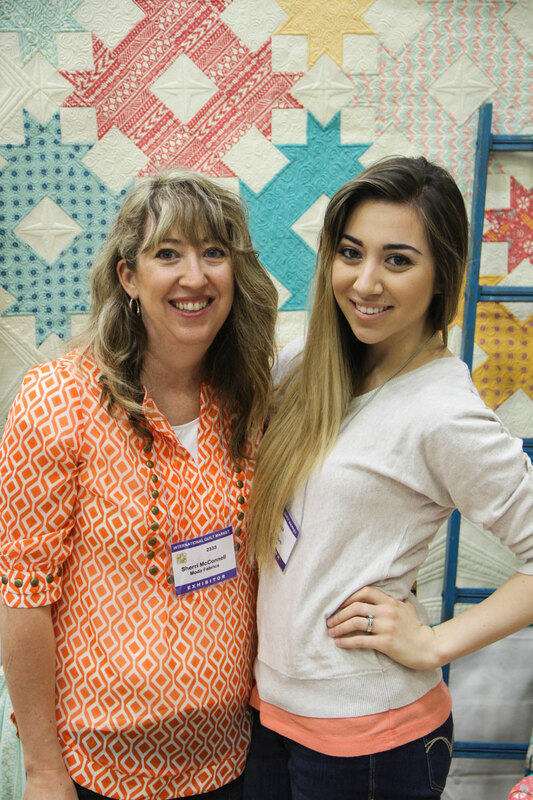 From the left, Sherri McConnell and Chelsi Stratton, aka A Quilting Life, and on the right, that’s Vanessa Goertzen of Lella Boutique. Vanessa is the only fabric-veteran of the group, the beautiful Gooseberry is her second collection for Moda. Corey? 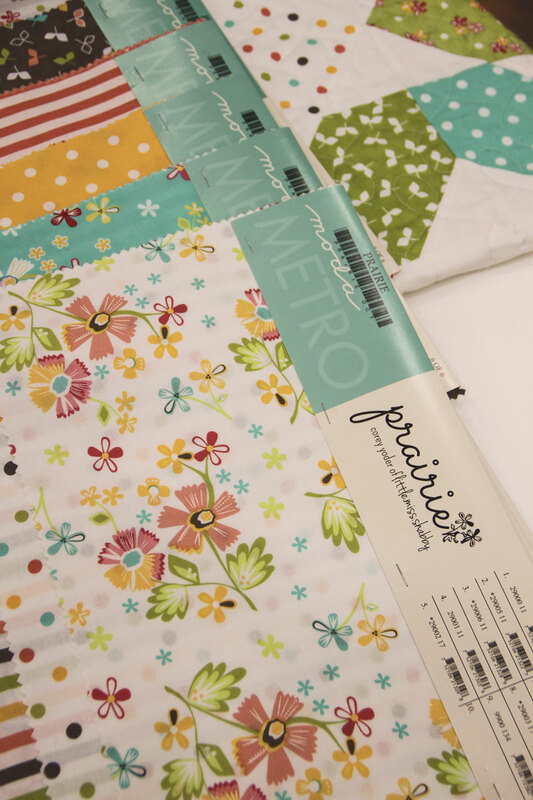 While Linzee was able to introduce you to Corey a few weeks ago, I get to show you her big-splash debut collection, Prairie, and the awesome quilts she designed for her new company, Coriander Quilts. The quilt on top is the mini version of Idyllic and the quilt on the bottom is Gingersnap. 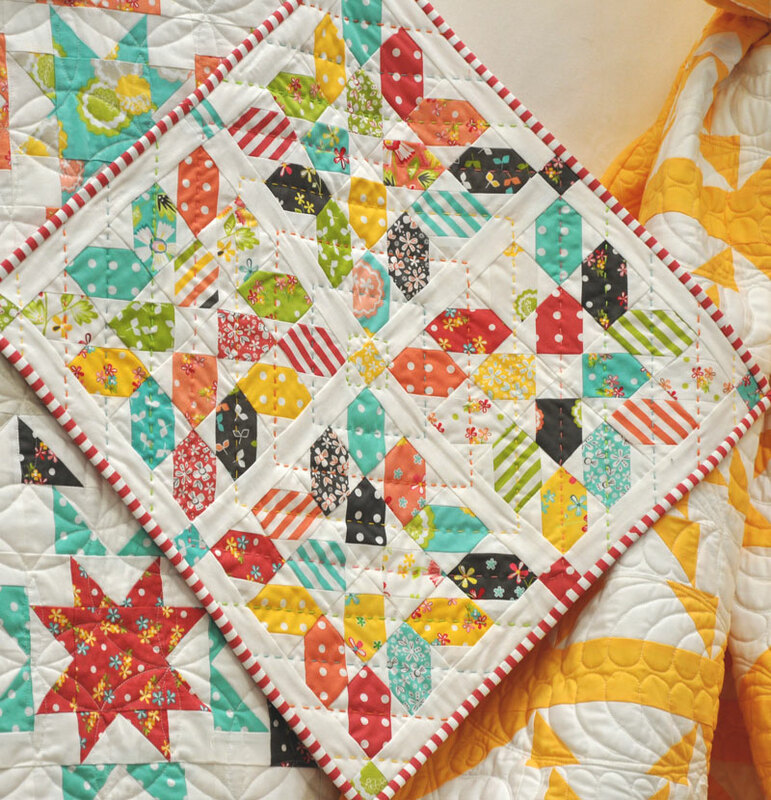 Corey made Gingersnap and then her Mom spent two days adding the big-stitch quilting with perle cotton and embroidery floss. It was the perfect finishing touch. (Way to go, Mom!) If you’re curious, Corey used Bella Solid No. 9900-97 for the white squares in the quilt, and the dark solid is Etchings Charcoal, Bella Solid No. 9900-171. 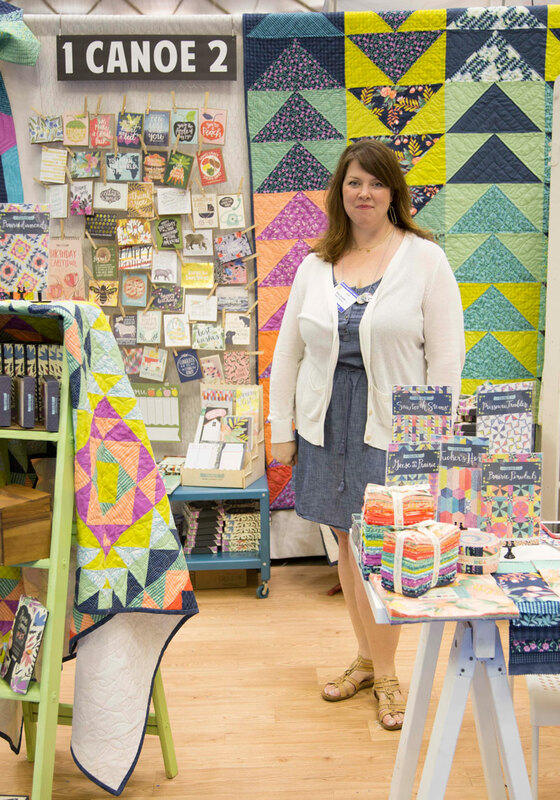 You can see the quilts behind Corey – isn’t she a sweetie? 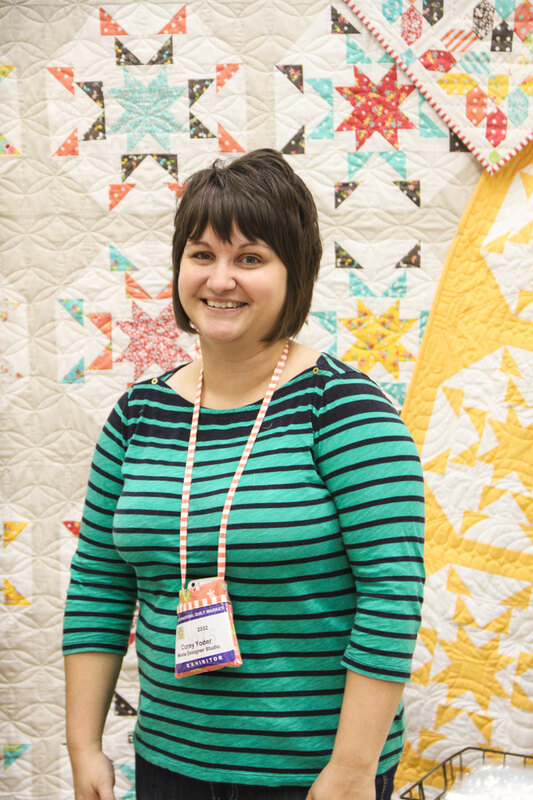 If the name Corey Yoder sounds familiar but Coriander Quilts doesn’t, you might know Corey as “Little Miss Shabby”, the author of the very popular blog of the same name. Corey first debuted with Moda on the Moda Bake Shop in 2011 with Sunny Trails, and became a very popular and prolific “chef”. She was a contributor to the Bake Shop’s Sweet Celebrations book, and she published her first solo book last year, Playful Petals. You can read about that on The Cutting Table here. 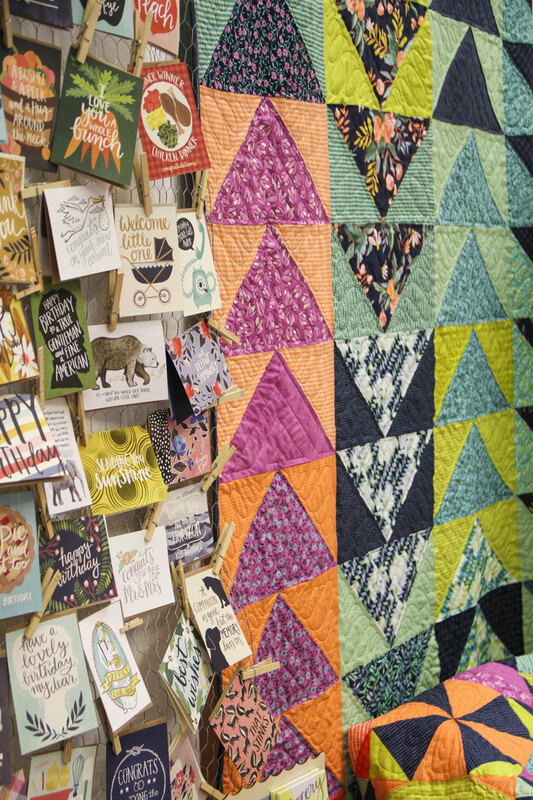 Corey had another gorgeous quilt at Market – Dashing – but we don’t see to have a picture of it so you can see it here. 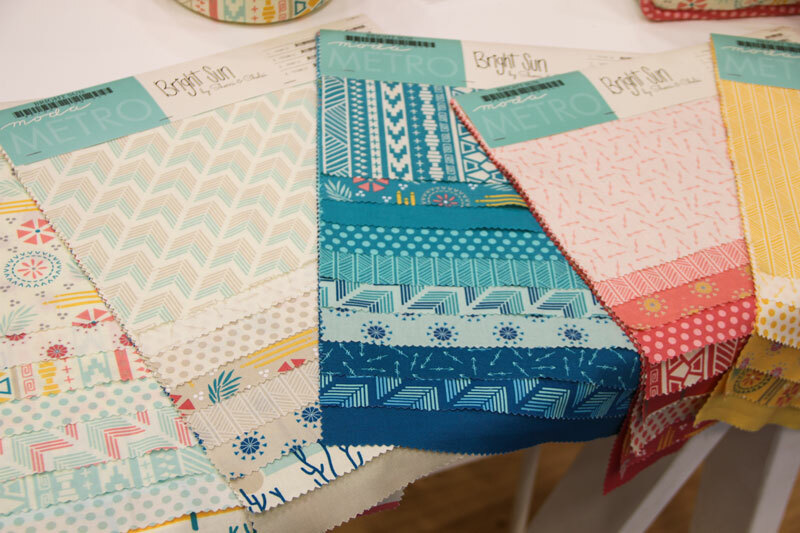 Bright Sun is a collaboration between Sherri and her daughter, Chelsi Stratton, a talented artist. 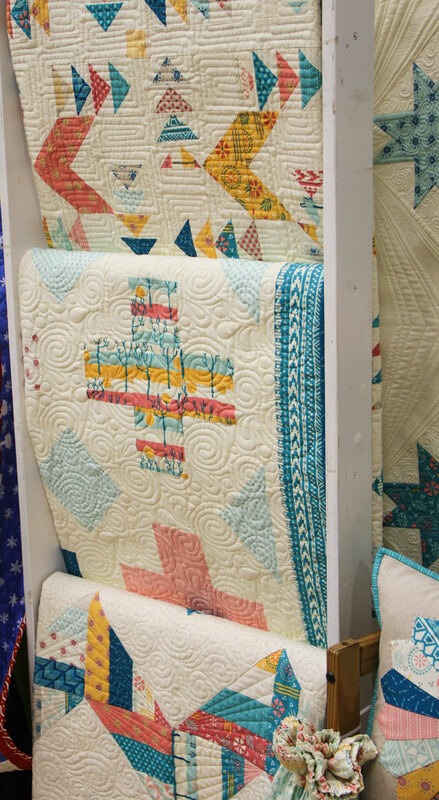 From top to bottom, the quilts are Shangri-La, Omaha and Anasazi. 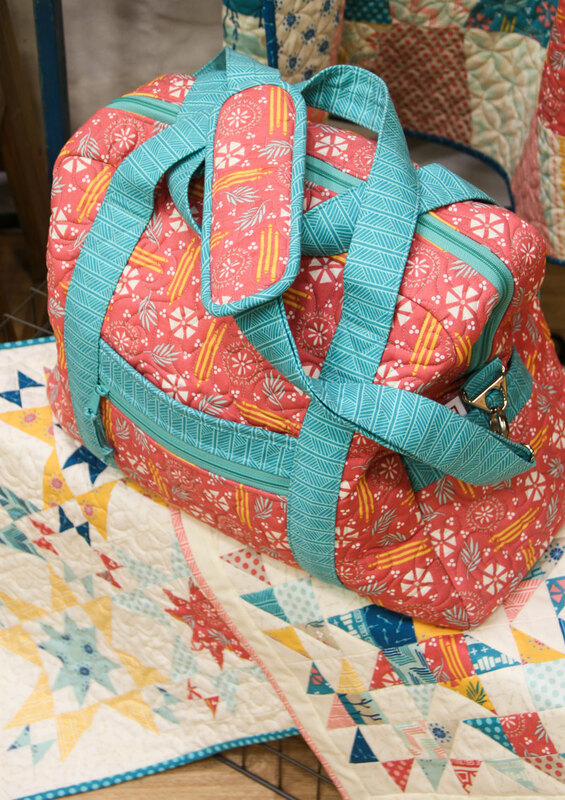 The bag is sitting on two of Sherri’s mini quilts – Star Bright on the left and Summer Star on the right. Carrie and Beth… sans Carrie. Or at least not the Carrie that is part of One Canoe Two. I hope you read about the terrific story of childhood friends Carrie Shyrock and Beth Snyder here a few weeks ago. Sharing the vision and the work is nothing new to this pair, and they had to do it during the week of Quilt Market. 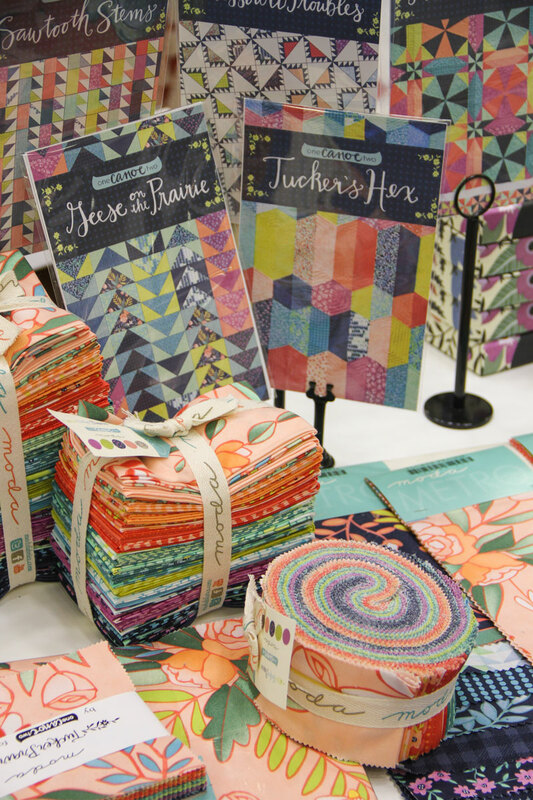 While Beth was in Minneapolis setting up the booth and handling things having to do with Tucker Prairie – their spectacular debut collection for Moda, Carrie was in New York City getting their booth ready for the National Stationery Show that started the day after Quilt Market ended. 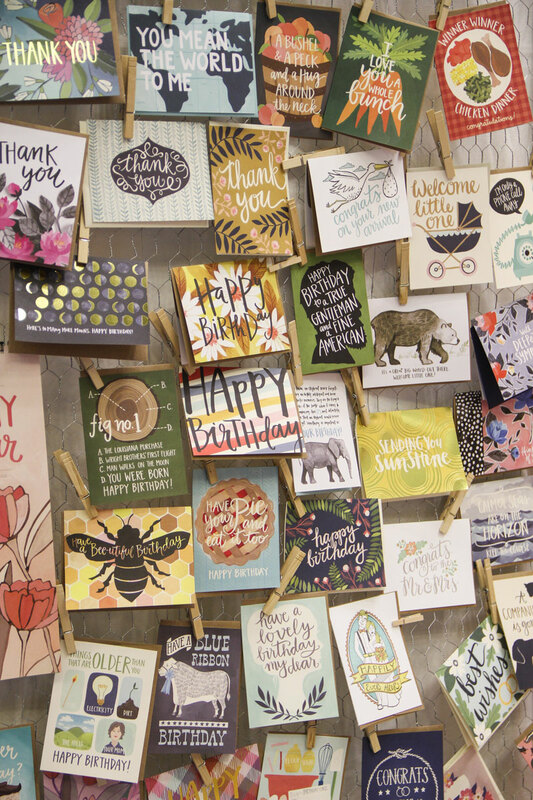 These are some of their cards – they’re terrific and yes, a few of these might have accidentally come loose and fallen into my bag. True story – I first learned of their letterpress company a few years ago and I have one of their quilt-y calendars from last year that I am never, ever throwing away, it’s that pretty. That’s Geese on the Prairie hanging and Prairie Pinwheels on the chair. Can you tell that these girls are just natural-born artists and designers? Those pattern covers rock! Missouri Troubles. Sawtooth Stems. Tuckers Hex. Prairie Diamonds. And finally, one of my new favorite people, Betsy Chutchian. Even if she is a diva! Betsy is one of those quilters whose name I have known for several years, but who I’d not actually met in person until last year. I collected all four of the books she published with Kansas City Star. (History Repeated is my favorite… but Just Treats No Tricks is a close second.) And Betsy really IS a diva! 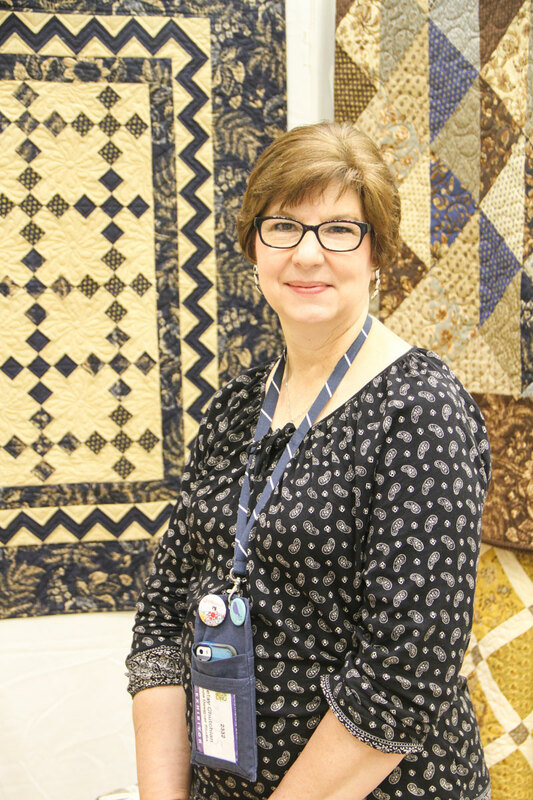 She’s one of the 19th Century Patchwork Divas, a group formed ten years ago by Betsy and her longtime friend, Carol Staehle. 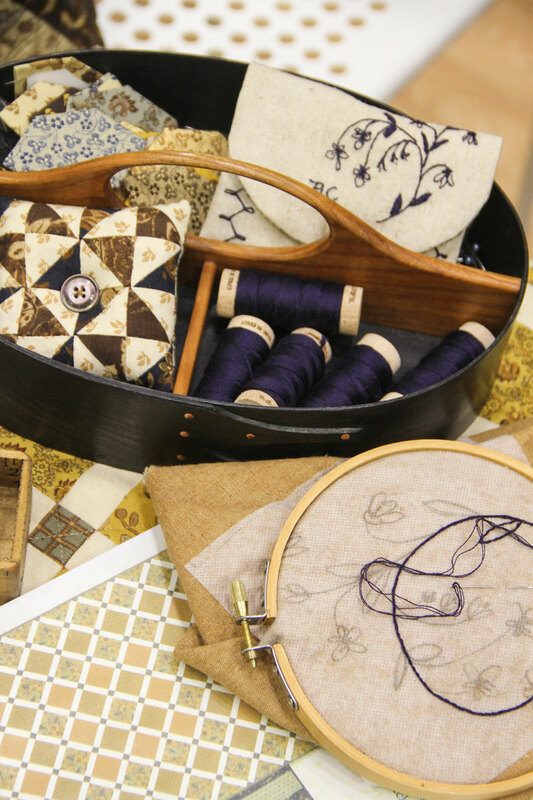 It’s a block exchange group that insists on skilled workmanship with intricate piecing and appliqued quilts made with Reproduction fabrics dating between 1800 and 1899. So there you have it. The newest part of the crew. I still say they’re goofy but they’re also very nice, hard-working and pretty talented. They’re all working on collection No. 2 – coming soon to one of those big congregations of quilters that I’m still not allowed to mention as officially being on any kind of calendar. Like it’s not going to happen anyway. What fun photos!! 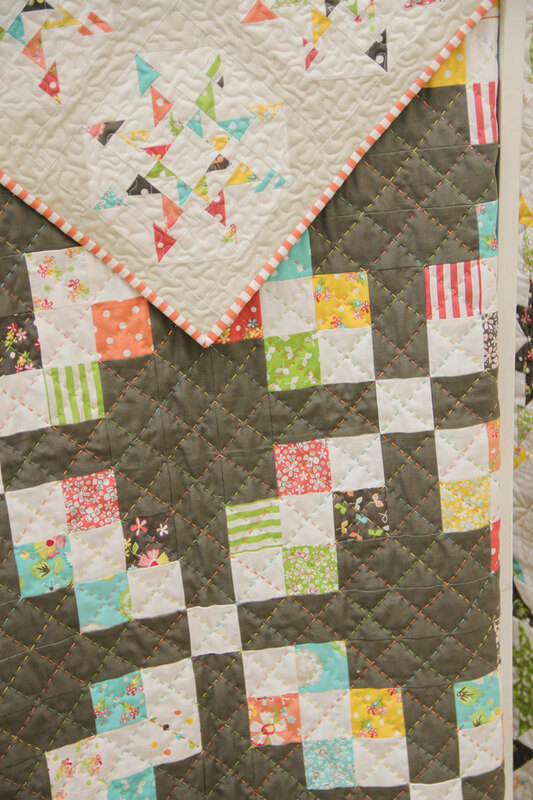 I’m hooked on the big stitching …love the look… fresh and modern. Maybe that’s because I’ve always have been an avid cross stitcher. What size of perle cotton are the people using for the big stitched quilts??? Hi Betty! This is a great question with a dozen answers – meaning, it depends on who you ask. Most of the folks I know who do a lot of big-stitch quilting are using Size 8 perle cotton, however some will use Size 12. A few will also mix in six-strand embroidery floss as there are so many more colors available, and they’ll use as few as two strands and as many as six strands. As a cross-stitcher, you already know that different brands of perle cotton and embroidery floss aren’t the same, some are thicker-fatter than others. So that’s also a consideration. And then just to make it even more fun, Jen Kingwell quilts using 12 wt. Aurifil thread. Thanks!! You are the first one to clearly explain this. Is the Aurifil 12wt. the new thread that is being offered? Have seen advertisements regarding their new floss offerings. Just have not seen it in person. Yes, I have lots of thread for cc, but most are hand dyed which will not work for quilting. Also, love sewing with Aurifil thread! 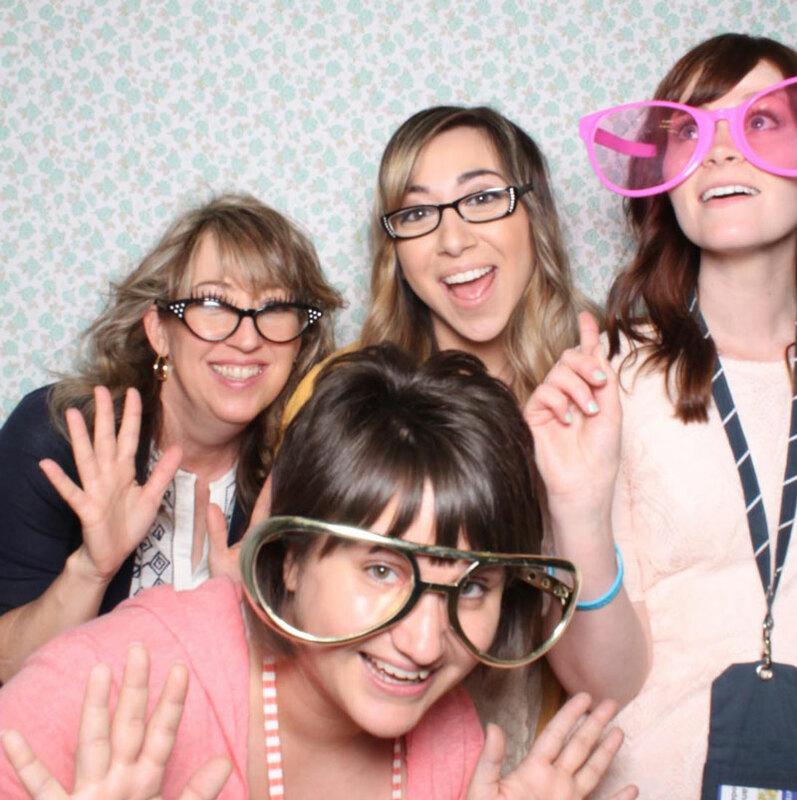 What a fun group of ladies! The new collections are lovely. Great posting. Fun reading about the newest Moda fabric designers. Thank you Carrie. If SarahZ is preoccupied with Betsy’s sewing tray, I am equally preoccupied with the embroidery she is working on. Is it available, do you know? Inquiring minds and all that! Thanks for all the updates! I am most excited for Sherri’s line and 1canoe2, Been following Beth since before they were a team and have lots of their products including the wonderful handmade recipe card box and cards. Lovely to read about the new designers and can’t wait until their fabrics hit my shops. Thanks for letting us meet them! Loved this post!! Can’t wait for the Prairie fabric!!! !